Teacher Appreciation Ideas: 15 Ways to Say Thank You To Your Teacher! 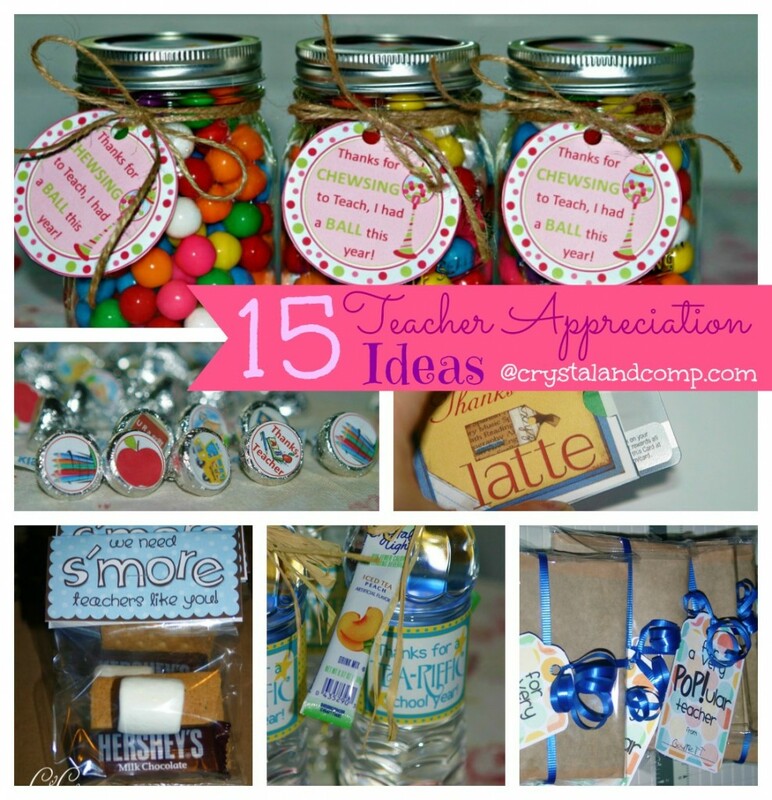 You are here: Home / DIY / Teacher Appreciation Ideas: 15 Ways to Say Thank You To Your Teacher! I am so happy when Crystal finds the time in her busy schedule (did you know she has 5 boys?!) to write fun stuff for us! You know I don’t craft or cook much – so, I am thrilled when she can send some fun stuff our way! Check out these great Teacher Appreciation Gifts she came up with! This is Crystal from the mommy resource site Crystal & Co. I am so excited to be here today on Grocery Shop for FREE to share with you some easy ways to say thank you to your kiddos teacher! In case you have not heard, this week is Teacher Appreciation Week. Not only is everyone showing their teacher how grateful they are for all that our educators do, but for the rest of the month, as this school year comes to a close, we will be saying Thank You. If you are looking for Teacher Appreciation ideas, I have 15 easy crafts that you can make for your teacher. Many of these are gifts your children can help you create. Most of them come with a FREEprintable. Even better, all of them are budget friendly! And, no worries if you have forgotten about Teacher Appreciation Week, it is never too late to say thank you- you have the rest of the month. Love this affordable treat! Just print and add it to a bag of microwave popcorn! This gift is always a hit. Just take graham crackers, a marshmallow and a snack size chocolate bar and you have an awesome gift when you add this FREE printable. Who does not love chocolate? Print these stickers and attach them to the bottom of Hershey Kisses. Perfect gift! (FREE printable)- giving your teacher a Starbucks giftcard? Make this card holder and your gift will standout! This is a super cute printable you can add to a water bottle with a packet of Crystal Light. Always a hit! (FREE printable)- are you giving your teacher a plant? Print this cute printable to include in your flower pot. Love it! Bubble gum may be off limits in the classroom, but your teacher will love this easy to make vintage bubble gum gift. (FREE printable) – this printable is perfect for little kids who cannot write independently. The printable has the entire poem ready for them to trace, color and give to their teacher! (FREE printable)- this is an awesome fill in the blank letter printable. Again, totally FREE. Make flowers for your teacher using coffee filters. Cute idea and super affordable. Every teacher needs a pencil holder. Re-purpose a can into a decorative and crafty pencil holder. teachers need magnets to hold on to papers and such. Decorate these clothespins and add a magnet to the back. Practical and crafty. When my kids were in public school and Mothers Day Out, I gave these picture frames every year to our teachers. Just use scrapbook embellishments and you have a gift that costs less than $10 and it is something they will treasure forever! love these customizable water bottles. Use a leftover spaghetti jar and Mod Podge it to make an awesome vase for your teacher. Give her flowers!